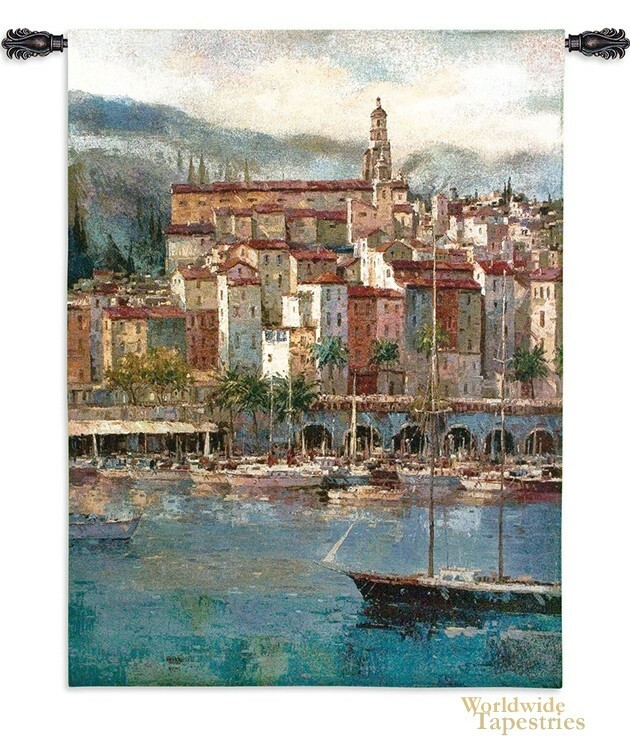 This tapestry "Mediterranean Harbor" shows a beautiful scene of a Mediterranean harbor by artist Peter Bell. The use of color here is vivid and evocative of memories, and is a hallmark of Bell's works. Here we see the richly beautiful buildings of this Tuscan Mediterranean portside city, with a large collection of boats and ships on the harbor, with one sailing by in the foreground. The buildings display the typical Italian and Tuscan appearance of their gorgeous archit ecture of their seaside ports. The distant hills and skies are atmospheric to create a use of light in this piece which is evocative. This tapestry "Mediterranean Harbor" is backed with a lining and has a tunnel for easy hanging. Note: tapestry rod and tassels, where pictured, are purchased separately.